FREE Pet Grooming Kit Promotion! As the weather warms up the risk of fleas and worms infecting your pet is greatly increased. Nobody wants their pets to be itchy and full of fleas or be at risk of heartworm so make sure you are well prepared as these pests get ready to attack. It's the perfect time to stock up on all your flea and worm preventative treatments and up until the 7th of October, 2011, you can receive a FREE grooming kit for your cat or dog when you purchase any 6 or 12 pack of Frontline Plus or Heartgard Plus! 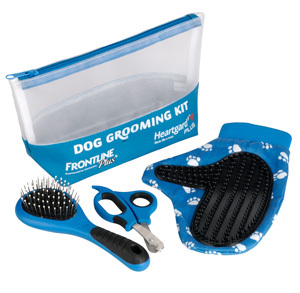 The grooming kits are full of the essentials to keep your pet looking good for the seasons ahead. A flea free and well groomed pet is also a recipe for a healthy and happy pet so be sure not to miss out on this limited offer as it is only available while stocks last so get your orders in now! 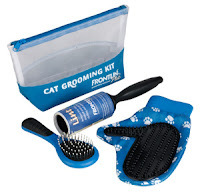 Cat grooming kit includes: 1x Cat Brush, 1x Cat Grooming Mit , 1x Lint Roller. Dog grooming kit includes: 1x Dog Brush, 1x Dog Grooming Mit, 1x Dog Nail Clippers. Visit the Free Grooming Kit Promotion Page for full details. VetShopAustralia Charity Donation Poll Results! Cats and Coffee Prove the Perfect Combination! Protect, Get Fit and Win Spring Promotion! Winter the dolphin makes a splash in Hollywood!